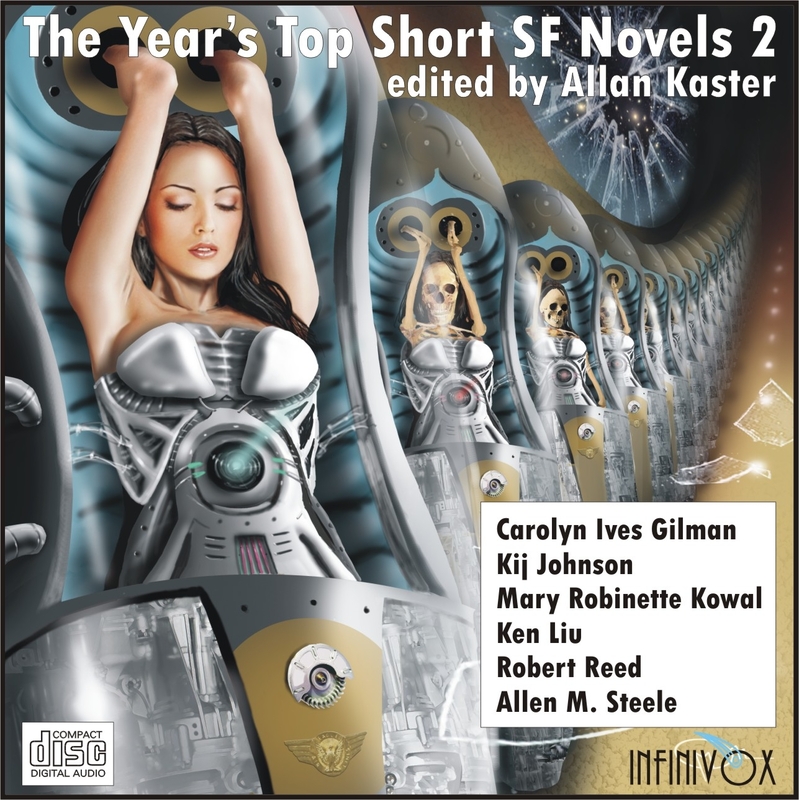 The Year’s Top Short SF Novels 2 is also available as an e-book for only $5.99 on the Kindle, Click here and the Nook Click here. Short novels are movie length narratives that may well be the perfect length for science fiction stories. This unabridged audio collection presents the best-of-the-best short science fiction novels published in 2011 by current and emerging masters of this form. In "The Ice Owl," by Carolyn Ives Gilman, an adolescent, female, Waster in the iron city of Glory to God finds an enigmatic tutor who provides her with much more than academic instruction while a fundamentalist revolt is underway. In the HUGO AWARD winner, "The Man Who Bridged the Mist," by Kij Johnson, an architect from the capital builds a bridge over a dangerous mist that will change more than just the Empire. In "Kiss Me Twice," by Mary Robinette Kowal, a detective, with the assistance of the police department's AI that takes on Mae West's persona, solves a murder with all the flair of an Asimov robot story. "The Man Who Ended History: A Documentary," by Ken Liu, is a moving chronicle of attempts to witness the history of Japanese atrocities against the Chinese in a World War II prison camp by traveling back in time using Bohm-Kirino particles. In "The Ants of Flanders," by Robert Reed, a teenage boy, incapable of fear, takes center stage in an alien invasion of Earth that pits alien foes against each other in a war that has no regard for mankind's existence. Finally, in "Angel of Europa," by Allen M. Steele, an arbiter aboard a space ship, exploring the moons of Jupiter, is resuscitated from a hibernation tank to investigate the deaths of two scientists that took place in a bathyscaphe underneath the global ocean of Europa.